(Interfax – MOSCOW, July 15, 2013) Russia’s Investigative Committee has denied allegations that the investigation of the 2009 assassination of Chechen human rights activist Natalya Estemirova has stalled and reiterated that, contrary to what is claimed by rights defenders, it sees militant Akhazur Bashayev as the primary suspect in the case. Investigations into Estemirova’s murder “have never been suspended” and the deadline for finishing them has been put back to August 15, 2013, Committee spokesman Vladimir Markin told Interfax on Monday, the fourth anniversary of Estemirova’s abduction in the Chechen capital, Grozny, after which she was found dead. “By this moment it has been established that Alkhazur Bashayev is complicit in Estemirova’s murder,” Markin said. He said Bashayev is in hiding, has been put on an international wanted list and has been charged in absentia with participation in an illegal armed group, abduction, murder and arms trafficking. The charges are backed by evidence “including the instrument of the murder that has been seized at the residential address of the accused, genetic and other tests, and the results of interrogations of more than 1,000 witnesses,” the spokesman said. “More than 80 forensic tests have been carried out, and more than 380 assignments and requests for information have been sent out to law enforcement agencies and human rights organizations and have been fulfilled,” he said. “In 2010, a request for legal assistance was sent to authorities in the French Republic, no response to which has arrived yet,” the spokesman said. He also claimed there is indisputable evidence that Bashayev had nothing to do with the crime. “We blew this theory to smithereens as far back as two years ago. They’re trying to sell the snow of yesteryears to us,” Cherkasov said. He said the theory was overturned by comparing DNA samples used as evidence with a DNA sample from a close relative of Bashayev’s who lives in France. Estemirova was abducted in Grozny on July 15, 2009. A while later she was found dead on the border between Chechnya and the Russian republic of Ingushetia with bullet wounds on her body. 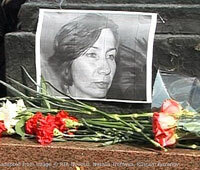 Estemirova was the best-known human rights defender in the North Caucasus and a friend of Novaya Gazeta journalist Anna Politkovskaya, who was shot dead in Moscow on October 7, 2006, and lawyer Stanislav Markelov, who was gunned down in spring 2009, also in Moscow. Memorial had to suspend its activities in Chechnya after Estemirova was killed. In September 2010, Investigative Committee Chairman Alexander Bastrykin claimed that serious progress had been made in investigating Estemirova’s murder. Media reports, citing law enforcement, named Bashayev as the main suspect, but Estemirova’s colleagues denied this. “Any theories where Bashayev is present in one way or another seem to us to be carefully concocted and far-fetched. The implicating evidence and possible motives seem to us to be highly questionable,” Cherkasov told Interfax.